Is anyone else fed up with the Federal Reserve? To paraphrase Irving Fisher’s famous quote about the stock market just before it crashed in 1929, we’ve reached a permanently high plateau of Fed mismanagement, Fed worship and Fed failure. The only legitimate role for a central bank is to provide emergency liquidity in financial panics to creditworthy borrowers. Once the bad debt (credit extended to failed enterprises and uncreditworthy borrowers) is written off, the system resets as asset valuations adjust to reality–how ever unpleasant that might be for the credulous participants who believed the ever-present permanently high plateau shuck and jive. — Bringing future sales/demand forward by lowering interest rates to zero just digs a gigantic hole in future sales/demand. Funny thing, the future eventually becomes the present, and instead of a brief recession of low demand we get an extended recession of weak demand and over-indebted households and enterprises. — Buying assets to artificially prop up markets completely distorts the markets’ ability to price assets based on real returns and real risk. 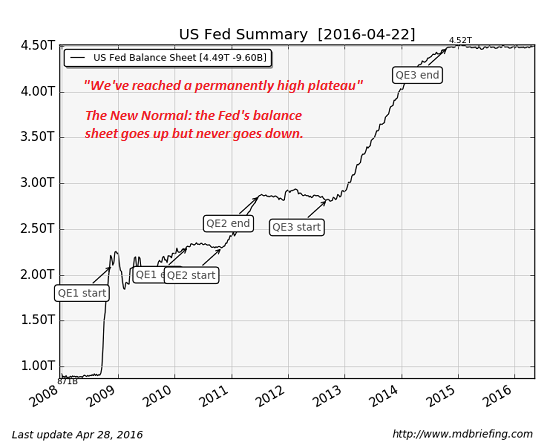 The Fed’s entire policy boils down to obscuring the real price of assets, credit and risk with a tsunami of debt. The Fed’s “solution” to the economy’s structural ills is: don’t worry about risk, valuation or costs–just borrow more money for whatever you want: new houses, vehicles, stock buy-backs, Brazilian bonds, worthless college degrees, it doesn’t matter: there’s plenty of credit for everything. The only thing that matters is your proximity to the Fed money spigot. If you’re a poor student, you get a high-cost student loan from the Fed’s flood of credit. If you’re a corporation or financier, well, the sky’s the limit: how many billions do you want to borrow or skim for stock buybacks or speculative carry trades? The Fed’s control of the machinery of obfuscating price and risk has made us all members of the Keynesian Cargo Cult. Now we all dance around the Fed’s idols, beseeching the Fed the save us from our financial sins. We study the tea leaves of the Fed’s announcements, and hold our breath lest the worst happen–gasp–the Fed might push interest rates up a quarter of a percent. Destroying our ability to discover the real cost of assets, credit and risk has not just crippled the markets–it’s crippled the entire economy. Wake up, America, and stop worshiping the false gods of the Fed. The sooner we smash the Fed’s idols and strip away their power to enrich the few at the expense of the many, the better off we’ll be.